The following week, I spent time with extended family, and witnessed a group of young white adults chanting Hindu bhajans as a part of the closing ceremony for the end of their yoga training and later went to a fusion wedding between a Pakistani friend and her now white husband. I noticed so many things that I don’t know if I would have paid as much attention to, had it not been for that weekend with SAALT in late-July. It took me a long time (much longer than I would like to admit) to truly realize how much South Asians benefit from—and actively take part in—anti-blackness in this country. I think I liked to believe that I sympathized with and cared about the struggle of black folk so much that it didn’t matter that I was a part of this (in some ways) privileged group of people. I look at my family and see how well we’ve played into Silicon Valley’s version of the model minority myth—my parents came from India with nothing and “made it” here, but what does that “making it” really mean? It means striving to reach the ideal of American life—that is, middle-to-upper-class whiteness. Whiteness is our model, and we brown folk, once we reach the peak that we are allowed to reach, are to be the subsequent model for black folk. We are not to stoop to their level—it is, after all, the opposite of anything white, and in white America, that is a sin. White supremacy wants us to believe, like them, that we are better than blackness. My boyfriend—before he was my boyfriend—and so many other brown men use the n-word with each other all the time. When I first called him out on it, he told me it was “just a word, Sanjana!” But it’s not, is it? It’s not just a word. It is a violent word with a history of systematic degradation and oppression and slavery and murder behind it, and it is not ours to use, let alone to try to reclaim. Unlearning is a process, of course, and I am still in the middle of it. Our choices as South Asians need to be deliberate. We need to pay attention to the people we look up to and aspire to be, to the things we want to do, even to the words we use. We need to examine why we choose to stand on the side that we stand on. Because right now, the United States is at war, and there is no middle ground. Silence is complicity; there is no neutrality. We either stand on the side of the oppressor or the oppressed, and every choice we make is a testament to that. I was in the car with my Pakistani friend before her wedding, going to get her hair done, and she told me that the other day, when she went to a salon, they tried to bleach her skin to make her lighter. The scary thing is, it’s not uncommon. She was told to lose weight and become lighter for the wedding—essentially, she was told to conform to white, colonial standards of beauty on a day that was supposed to celebrate her in all her beauty. They seem like harmless choices—even beneficial choices—but they are, in fact, violent. They harm not only black folk, but they harm our own communities as well. This post was originally published on Brown Girl Magazine, and being republished with their permission. Today, the 14th anniversary of the tragic events of September 11th, South Asians are the most rapidly growing demographic group in the country numbering over 4.3 million. Yet, as our communities continue to grow in new, unexpected, and longtime destinations, we are increasingly the targets of hate violence, suspicion, and surveillance. Muslims, Arabs, South Asians, and those perceived as Muslim have borne the brunt of a continued post-9/11 backlash, reflected in policies that cast our communities as un-American, disloyal, and suspect. Muslim, Arab, and South Asian communities were swiftly targeted for “special registration” through the National Security Entry-Exit Registration System (NSEERS) program just months after the events of September 11th. Through NSEERS, more than 80,000 men were required to register with the federal government; thousands more were subjected to additional interrogation, detention, and deportation. Nevertheless, this extensive and misguided program did not result in a single known terrorism-related conviction. A surveillance system first deployed against the Black Freedom Struggle, adapted for NSEERS, and then evolved to spy on Muslim communities through FBI mapping programs is now in the third stage of its evolution through the current Countering Violent Extremism (CVE) program, which single-mindedly focuses on Muslims to identify and crack down on violent extremism. The same system continues full circle today to surveil Black Lives Matter movement leaders. The current political debate continues to poison and inform the national discourse about our communities and immigrant communities at large. SAALT captured this troubling dynamic in our September 2014 report, Under Suspicion, Under Attack,which tracked a nearly 40% increase in xenophobic political rhetoric from our previous 2010 report. Furthermore, over 90% of these comments were motivated by anti-Muslim sentiment. Some of the most egregious political rhetoric from presidential candidates Donald Trump and Jeb Bush, among others has currently labeled immigrants as “illegals” and “anchor babies.” This wholesale and unacceptable language implies some do not have the right to be in the United States, the quintessential nation of immigrants. 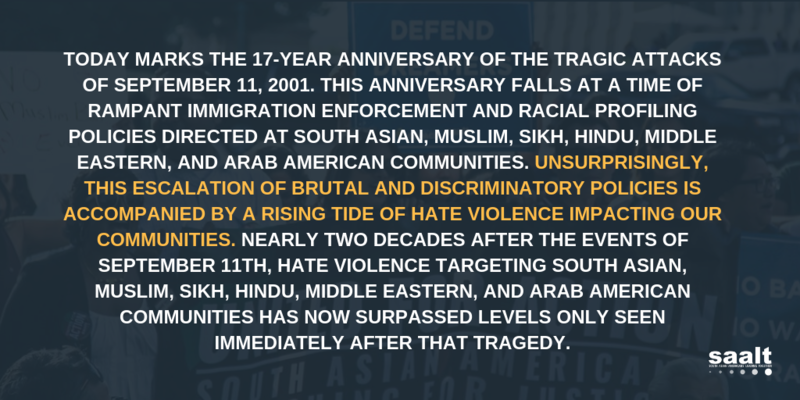 Fourteen years after increasingly xenophobic political rhetoric and misguided federal policies painted our communities as disloyal, monolithic, and suspicious with no results, Muslim, Arab, and South Asian communities appear to increasingly be the targets of hate violence. SAALT’s report, Under Suspicion, Under Attack, also documented 76 incidents of hate violence against our communities from January 2011 through April 2014. Over 80% of these incidents were motivated by anti-Muslim sentiment. In fact, the most recent FBI hate crime statistics released last year show that anti-Islamic hate crimes are at their highest since 2001. 2015 has seen a wave of violent incidents aimed at Muslim, Arab, and South Asian communities. In February,three Arab Muslim students at University of North Carolina-Chapel Hill were gunned down execution-style, apparently due to their religion. Later that month, a Pakistani Muslim man and father of three in Kentucky was shot and killed in his car after dropping his daughter off at school. This week a Sikh man in Chicago was approached by another driver who yelled “terrorist go back to your country” and violently beat him in his own car, requiring hospitalization. And we cannot forget when a known white supremacist walked into a Sikh house of worship, or gurdwara, and shot and killed six Sikh community members in Oak Creek, Wisconsin in 2012. Earlier this year a vicious and deadly attack by a white supremacist in Mother Emanuel AME Church in Charleston, South Carolina, left nine Black community members dead. We join other communities of color to address the growing threat of white supremacy that has burgeoned nationwide. According to the Southern Poverty Law Center, the number of white supremacist groups in the United States has grown over 54% from 2000 to 2014. Now more than ever, South Asian communities need and deserve trust with law enforcement at multiple levels as we grow in number and continue to be targets of violence. In response, SAALT developed a proposal and successfully advocated for the creation of the White House Interagency Task Force on Hate Violence last year. We are working to ensure the task force focuses on the unique barriers our communities face with law enforcement to report and prevent hate crimes, particularly after the revised Department of Justice Profiling Guidance was released last year, including exemptions for national security, border security, and state and local law enforcement. We have seen what happens when our communities are victimized rather than protected by law enforcement: earlier this year Sureshbhai Patel, an Indian grandfather in Madison, Alabama, was beaten to the point of partial paralysis by a local police officer in his son’s neighborhood. He was mistaken for Black, recognized later as a South Asian immigrant with limited English ability, and ultimately brutalized by law enforcement. To truly realize our values as a nation, everyone is entitled to equal protection under the law. Our communities deserve to know their rights, feel empowered to report hate violence, address xenophobic political rhetoric that will certainly surge further in this election cycle, and build meaningful relationships with government and law enforcement. In order for our communities to flourish as we grow, we must advance policies that uphold our core American values of diversity, inclusion, equal rights, and protection for all.